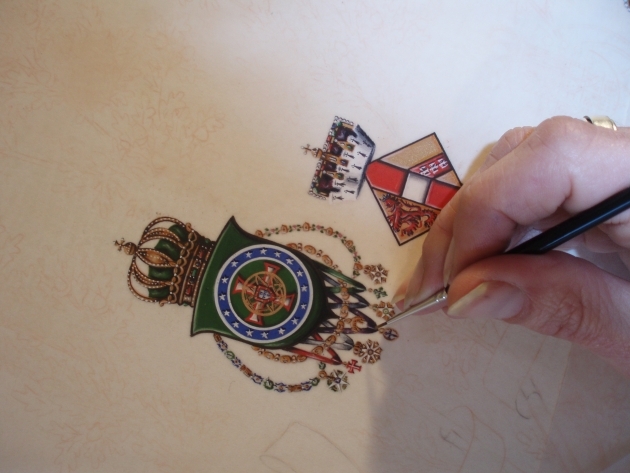 When commissioning artwork, please feel free to contact me direct by telephone, (+44) 01392 444190 or by email, mail@calligraphyandheraldry.com and I will gladly discuss any commissioning of artwork with you. Please forward as much information as possible, including images, Arms, blazons, or text, as this will help to give an estimate for the work. Estimates produced are based on an hourly rate plus materials and complexity of work. All work produced is based on the information provided before hand and I ensure that the initial rough draft for approval is of suitable quality to avoid changes. Should further changes to the design rough be required then I allow for one change before a £20 design fee is charged for each change.This fee is subject to change with regards to the commission. I ensure that the client and myself are satisfied with the design before progressing to final artwork and updates are provided throughout the commission if necessary, helping the client to understand the work in progress. It remains important that each client receives exactly what they wish for and that I am content with the finished design and product. Every piece of work is very different and costs do vary depending on complexity of design, size and time. I am very happy to discuss pricing and to create work that suits every budget. I currently have a lead time scale for new commissions of 3-4 months. Should you be interested please contact me and I will book you in! Based on an hourly rate of £35 per hour plus materials. Time is taken in order to produce the best possible work. Level 6: Go on...have a go!!! It will be worth it! All prices are based on the artists current costs of production and estimated time involved unless otherwise agreed. Prices are subject to amendment any time to meet any change in production costs such as materials or to reflect the actual amount of work carried out. The estimate shall not include the cost of further amendments unless agreed and does not include postage and packing. A 50% percent deposit must be paid before the commencement of any work, upon agreement of the estimated cost. Overseas clients are subject to a 100% payment of the estimated costs unless otherwise agreed. Payment is due within 10 days of the date of the invoice, or must be paid in full before any artwork is sent to the customer. Payment can be made direct to Neil Bromley, via a bank transfer or by cheque. If payment is made from overseas, either a Bank Transfer , PayPal ,Western Union ,or a bank cheque are accepted. Bank Details are given if required. I understand that each and every piece of work is very personal and I try my very best to create exactly what you require and to deliver the best artwork at the highest standard for this medieval craft. It is such a delight to be producing such work in this modern computer age whilst using medieval techniques. Framing and photographing artwork can be arranged by Neil to deliver high res images for reproduction along with that final issue of choosing the right frame! Neil is always involved throughout the process to ensure your artwork receives the best possible finish and frame to enhance the finished work. All artwork is conservation, archival and museum framed. Cost of Framing: This is outsourced to a guild of craftsmen gallery and can vary..All framing is overseen by Neil and must be paid in advance upon the given quote. Shipping can also be arranged via DHL or by Royal Mail Special delivery or International Signed post.